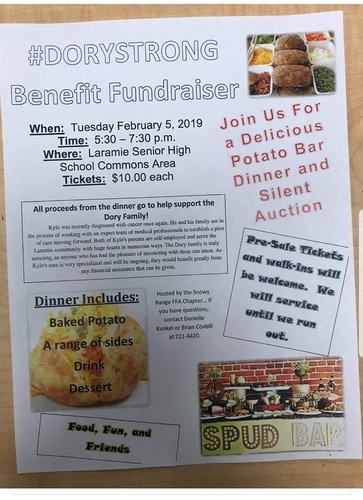 Join us for a Delicious Potato Bar Dinner and Silent Auction to benefit the Dory Family! Hosted by the Snowy Range FFA Chapter. Kyle dory was recently diagnosed with cancer. He and his family are in the process of working witha team of expert medical professionals to establish a plan of care moving forward. Both of Kyle's parents are self-employed and serve the Laramie community in a number of ways. The Dory family is truly amazing, as anyone who has had the pleasure of meeting them can attest. As Kyle's care is very specialized and will be ongoing, the Dory family will benefit greatly from any financial assistance that can be given. Pre-sale tickets and walk-ins will be welcome. Dinner includes a baked potato, a variety of sides, a drink, and dessert.